A true classic, the Lagavulin 16 was the first bottle of whisky I spent more than $50 on. And after my first sip I was so utterly disappointed I’d thrown my money away on a whisky that smelled and tasted as nasty as it did: a rotting, mossy tree trunk with a nasty tonic from my childhood thrown on it—that’s what I remember thinking after my first sip and sniff. How I’ve changed in a decade. 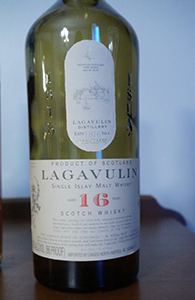 Whether Lagavulin 16 has or not is a more controversial matter. There are those who insist it has and not for the good—it’s always hard for me to extricate this sort of a judgement from a more general expression of belief in whisky entropy (“everything changes for the worse”); on the other hand, there are those who say it has maintained its quality and general profile over time. I am in the latter camp but I grant that I have not tasted a Lagavulin 16 bottled since 2008 or so. Well, this bottle—which belonged to a good friend who left the country and also left some bottles for a couple of us to split—is from 2012. This bottle’s been open for at least a year and when I poured my share it was down to the last third or so. Nose: Meaty smoke, pencil lead and disinfectant. Some ink too and a bit of charred wood. Gets brinier as it sits and also a little lemony with some oyster liquor thrown in as well. And there’s a touch of that peat moss that freaked me out on my first ever taste, way back when. With more time there’s some polished leather. A drop of water intensifies the lemon-oyster combo and adds some olive brine to it. Palate: The smoke is much ashier on the palate and more intense—behind it there’s the inky note and then the brine. On the second sip there’s some of the lemon and the smoke is more tarry. The mouthfeel is a bit thin. Gets saltier with each sip and the citrus moves closer to orange. With more time the smoke begins to turn a little acidic. Water cuts the acidity and makes it sweeter; thins it out even more, alas. Finish: Long; much longer than you would expect from a whisky at 43%. The smoke goes on for a long time getting woodier and more bitter as it goes. The sweetness continues into the finish with water with wet stones and soot. Comments: Not as dense and dark as it used to be but still very good. The nose, in particular, is great; it’s just a little too thin on the palate—that may well be because this is from the end of the bottle but it’s the part I’m drinking. And call me crazy, but I can see a clear through-line from this to the glorious 21 yo. If this is decline may I also decline this well. This entry was posted in -Whisky by Rating, 85-89 points, Lagavulin and tagged *Whisky, Islay, Lagavulin, Peat, Scotch, Single Malt. Bookmark the permalink. Great writeup, makes it obvious why this was the start of so many people’s malt journeys. But no sherry notes? I wouldn’t expect any, but so many other reviewers seem convinced that even in recent bottlings there is the presence of oloroso. I would say the orange on the palate and the inky/graphite notes on the nose could be indicators of sherry, but it’s not in any sense a sherried malt. It might well be that if I were looking for it I might find more signs of it, but it didn’t jump out. I don’t think it’s entirely a case of belief in whisky entropy as much as acknowledgement that demand pressure on good oak/casks, logically and inevitably, has to take its toll somewhere. There is a growing trend which says that increased personal whisky experience accounts for perceived lower quality of familiar whisky upon re-review – that it’s the reviewer, not the whisky, which is changing – and I think it’s often more palatable than to believe a lot of whisky is in decline. Jeff, I agree with you in general (and in a few days there’ll be a review of a whisky that I think fits your description). What I was trying suggest is that this trend, which may generally be true, is sometimes seen to apply even in particular cases that may buck it. Actually, wait, now that I’ve had a cup of tea and re-read your comment, no, my upcoming review is not going to fit the description of the trend you identify in the second part of your comment. Anyway, my point is that if you go back to classic/standard malts with an “open” palate, so to speak, you may find they are still quite similar or that they’ve changed; you may find you like them the same, more or less regardless. The hard thing, I think, is to make this evaluation independent of narratives you already subscribe to (in part or wholly) and which may generally be true (the narrative of decline for the reasons you give, for example). In this case, I found the Lagavulin 16 changed somewhat (less “dense and dark”) but still very good. If someone has a well-maintained, unopened bottle of pre-2005 Lagavulin 16 and they’re willing to share a sample I’d be very happy to compare them head to head; but in the meantime I don’t want to sell this one short because of the mythology of an older version that I haven’t had in a long while. To be sure, there are other whiskies about which I don’t feel this way. Happy to see you found that salt note. I had a good pour of this at a bar this weekend and was surprised by how salty the palate became. Do you remember if it always had that characteristic? If I find an older bottle of Lag 16, I’ll let you know. A proper head-to-head needs to be done.